U.S. Army Pfc. 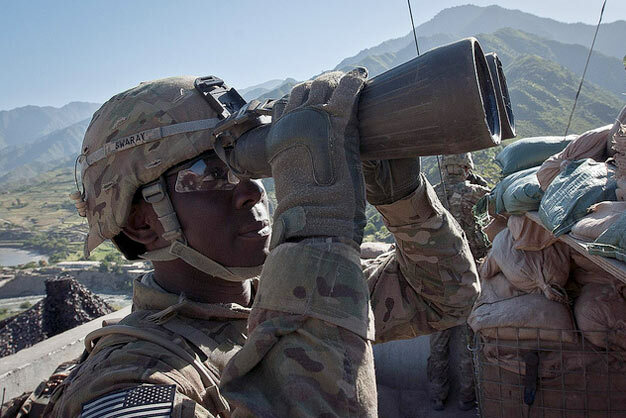 William A. Swaray, an infantryman and native of Monrovia, Liberia, assigned to Company B, 2nd Battalion, 27th Infantry Regiment, Task Force No Fear, 3rd Brigade Combat Team, 25th Infantry Division, TF Bronco, scans for insurgent activity at Observation Post Coleman outside of Combat Outpost Monti in eastern Afghanistan’s Kunar Province, May 5. Swaray joined the Army at 38 to fight for a country he has adopted as his own. Photo via US Army.